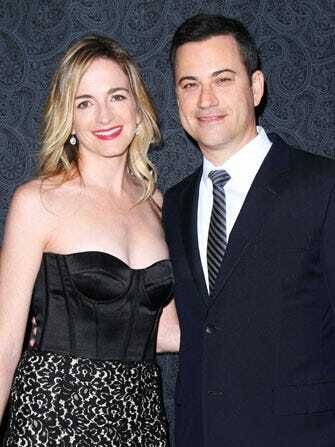 Jimmy Kimmel & His Wife Are Expecting! Jimmy Kimmel had a knockout 2013, and it seems like this year is poised to be even better. The funnyman is officially expecting a baby with wife Molly McNearney. Kimmel took to Ellen to make the big announcement, and of course, had a few jokes to crack as well. "I'm having a baby," he told the crowd. "Wait, I wanna finish — with Ellen." Once he cleared up the fact that he was, in fact, having said baby with his wife (for this go-around, anyways), he kept the laughs going. "It is very weird at my age," he continued. "I'm going to be one of those old dads...I'm getting older every single day." He also joked about possible names for the soon-to-be bundle of joy (Karate and The Riddler were thrown in the mix), and being behind on all the parenting trends these days. McNearney also chimed in with her own baby announcement, tweeting, "Yes, I'm pregnant. When can I get my epidural?" If we know one thing about baby Kimmel, we can bet he or she is going to be darn funny.